Suitable for both beginners and the more experienced practitioner, there are no surprises as the material assessed is covered in the course training. This course is a blend of sound outdoor knowledge coupled with an understanding of nature and its uses. The course equips our clients with the skills needed to feel confident and to live comfortably out of doors regardless of your activity. 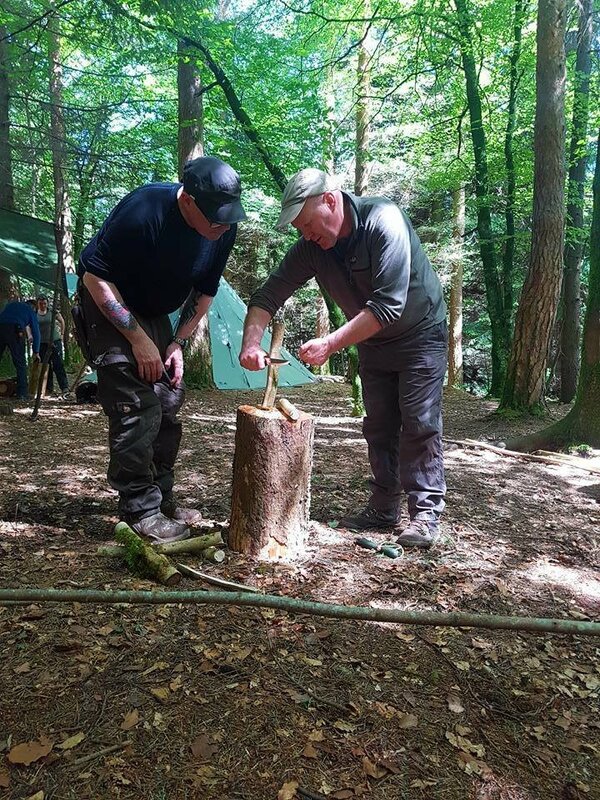 We cover all of the subjects generally perceived as bushcraft but also explore the natural world and the uses it can be put to. The amount of material covered and the length of the course makes this one of the most in-depth and thorough of its kind. It is an intensive course with all of the skills being taught and demonstrated to a very high level. There is also plenty of time to practice under skilled guidance ensuring students are confident in their knowledge. It has grown to be one of our most popular courses attracting clients from Europe as well as the UK. The course runs in a five day block followed by a further three day assessment block leaving time for a consolidation period in between allowing you time to practice and perfect your skills. The award is endorsed by the NCFE UK who are responsible for certification. Successful candidates will receive a certificate in Advanced Bushcraft Award Level 3 with both Woodcraft School and the NCFE logo present. Read a review from Bushcraft magazine editor Steve Kirk who attended this course. Assessment Monday 9th September 2019 to Wednesday 11th September 2019. Please note that by booking on this course you agree to our terms and conditions. Price includes camping onsite using own equipment. Alternatively, we can offer an accommodation package for those would like to stay in our tipis or tree tents. As outdoor living skills are an integral part of the teaching, it is required that you camp onsite for the duration of the course and again for the duration of the assessment. There will be practice sessions in the evening time which are an important part of the course. There is a catering option available for this course which includes breakfast, lunch, evening meal along with tea and coffee. Vegetarian option available on request. Aimed at 18 years and over although we do offer places to younger people at our discretion. Please enquire. This entire award has been accredited by the NCFE as a Level 3 award. This means that the subjects mentioned above are taught and assessed at an advanced level. The process of assessment and accreditation is run by the NCFE who are responsible for the quality assurance and control exactly as they would be with any other award they run. If you have any questions or would like more information about this course, please feel free to contact us for an informal chat.